These are descriptions of some of the graduate-level courses I have offered in the past few years. The transformative power of literacy remains a pervasive concept in contemporary culture. 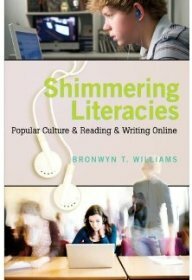 Even within the field of literacy studies, where there have been critiques of the mythologies of literacy, the narrative that reading and writing can be empowering and transformative remains enmeshed in the institutions and scholarship. Yet transformation, if it happens, may be a complex set of experiences that are partial, recursive, and not uniformly positive. These experiences, and the social performances and personal conceptions of identity they shape, are vital to understanding literacy practices and teaching. This seminar will explore questions of literacy, identity, and agency that take place both in and out of school. We will explore how issues of identity and agency shape and are discussed in scholarship about literacy practices both in and out of the classroom. In particularly we will examine how conceptions and performances of identity intersect with issues of power, technology, rhetorical awareness, relationships, memory, and emotion. The seminar will finish with a discussion of the implications for pedagogy of theories and practices of literacy, identity, and agency. Literacy is an ongoing, vibrant part of the experiences of everyone in our culture and shapes experiences and identities in virtually every part of our lives. This course will focus on several key conversations about how writing and reading takes place in non-school settings. First, we will dig into the varied and growing body of research on the literacy practices of people in their daily lives. We’ll be reading a number of different texts across cultures and communities and discussing the factors that shape literacy practices in different communities, and in turn how those communities shape conceptions and engagement with creating and interpreting texts. We will also talk about the approaches of the researchers in terms of their methods and ethics. Also, we will explore approaches for engaging in literacy research and pedagogy in community settings. We will use participatory action research as a way of thinking about how such work can offer ways of co-creating knowledge and sustainable change in academic-community partnerships. We will also be talking about ethical concerns involved in such work. The course will also involve engagement with a community literacy project or organization. Finally, we will also be discussing the implications of research and action around issues of community literacy for the identity of the rhetoric and composition as a field. We will think about how we define ourselves and our goals, and how institutional systems and ideologies complicate this kind of work. This course will both use film studies as a way to approach a critical investigation of genre, and use genre theory as a way of understanding film. We will be reading and discussing genre theory and talking about the nature of genre – and the complexities of the concept – and thinking about how we make use of it in our interpretation and analysis of texts. We’ll be applying theories of genre to film and seeing how such theories operate in film, what kind of critical and rhetorical work they do, and what tensions and inconsistencies are involved in such an approach. We will explore how genres develop and the historical, material, and cultural forces that shape our conceptions of genre. In addition, we will think about how genre in a popular medium such as film reproduces or disrupts dominant ideologies. What, for example, do our conceptions of genre tell us about our culture at a given moment? Our discussions will include considerations of narrative, rhetoric, identity, culture, and material conditions. We’ll be watching and talking about a rather lengthy, and eclectic, range of films. No one who teaches writing needs to be told that digital media are changing the way we, our students, and most people in the culture, compose and interpret texts. What’s less obvious is what this means to those of us who do teach writing and literacy courses. The rapidity of the changes in how we can create and read texts raises questions that are central to how we think about teaching. Among the questions we will address in this class will be: How have our jobs changed in the past twenty years and what should they look like now? How have the changes in the nature of texts changed the nature of our courses? What digital media should we embrace in the composition classroom? What new pedagogical approaches do new media offer to us? How do we connect composition pedagogy developed around print to new ways of creating and interpreting texts? How do questions of identity, of class, gender, race, culture, affect how we should approach teaching with digital media? What are the material conditions that are shaping what we can or should do with digital media in a writing classroom? In this course we will explore these and other questions. We will read from a wide variety of sources, including scholarship on composition pedagogy, digital writing, media studies, popular culture, new literacy studies, graphic arts, and visual rhetoric. This class will be more than just reading and discussion, however. We will also work with digital technologies to learn how to produce and imagine new pedagogical approaches for our classrooms.